In this episode, Robert and I share some of the highlights from Intelligent Content Conference 2017. In particular, we touch on some important industry trends to keep an eye on, including big businesses (like Netflix and Arrow) that are increasing their investments in original content. Our rants and raves cover Netflix’s huge Hollywood appetite, and what it takes to make the move from content marketer to content strategist. 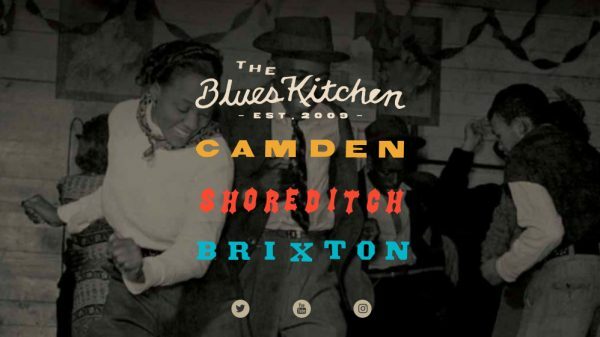 Then we close the show with an example of the week from The Blues Kitchen. Robert closed the show with a Q&A interview with iconoclastic journalist Fran Lebowitz. As an interviewer who cares about value for the audience, Robert was thrilled with how well the discussion seemed to resonate. But as a content marketer who wanted to learn something new, he admits the conversation left something to be desired. Of course, some members of Fran’s fan base might not agree with this – or any – critique. For example, one attendee took to Medium to express her adoration for her favorite “angry woman” and the “epic rant” she delivered at the event. Robert’s overall impression: He was pleasantly surprised by the number of attendees who made it a point to tell him just how much they appreciated having content strategy insights to inform their marketing actions, rather than only having a marketer’s point of view to work from. We were both encouraged to see that marketers finally seem to be getting what we mean when we talk about the business model of content. The biggest thing I took away from the event has to do with preparing businesses for the impending artificial intelligence (AI) revolution: If you are going to try to take unnecessary human involvement out of the content creation process and scale it as much as you can, you need to understand how to set up your content with a certain structure, in a certain way, so that the technology can do its job in the most efficient and elegant way. Other favorite moments: Will Reynolds gave what may have been the best talk on SEO that Robert has ever seen; and I got to do a Q&A with Victor Gao about my favorite content marketing case study: Arrow Electronics. Parse.ly – Getting There: How Brands, Publishers, and Agencies Use Content Analytics: With content creation and promotion comes a lot of data. If you have a digital audience, there’s a good chance that you have trouble connecting the information your data provides with a way to use it to improve your content strategy. Don’t worry – you’re not alone. Parse.ly (the company, not the herb) has researched the state of content analytics with a survey of publishers, brands – anyone that creates content. 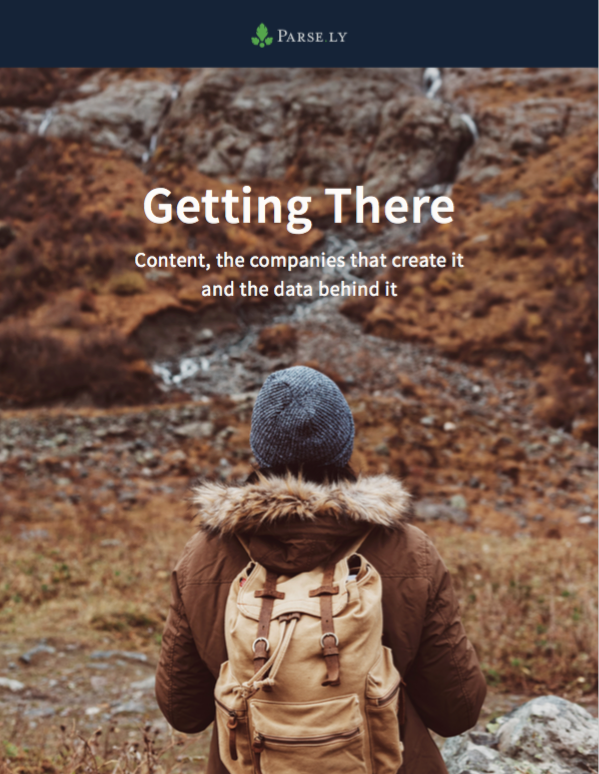 The report it produced on the findings reveals what metrics the industry considers most useful, the siloed state of brand and publisher offices when it comes to data access, and how their analytics end up impacting the content they create. Get it now. Robert’s commentary: Anyone who says original content creation is a dying art needs to pay close attention to a fascinating emerging trend. A new article on Business-Standard.com talks about the ravenous content monster that Netflix has become, and how its appetites for original content is causing escalating tensions in Hollywood. According to the article, Netflix’s spending on original and acquired programming this year is expected to be more than $6 billion – more than double what HBO spends. This stat blew Robert away, and he feels the opportunity it opens up for content creators – and investors – is an important one. Robert’s rave: After recently ranting about an advertising tech story no one else seemed to be tackling, Robert was thrilled to find a post on Doc Searls’ Harvard University blog that comes really close. The post contends that brands need to break up with ad-tech because, while they think they are buying online ads, they are actually paying to chase eyeballs. It does a great job of walking readers through all of the issues we’ve been talking about, and more. Joe’s commentary: One of my favorite sessions from ICC was one that I just happened to moderate. 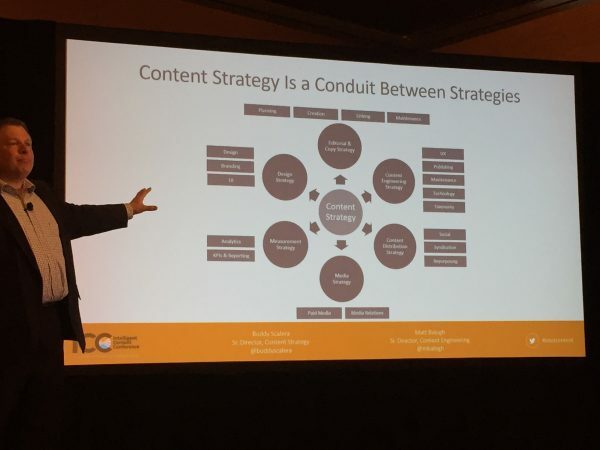 Buddy Scalera and Matthew Balogh of The Medicines Company gave a thoroughly engaging talk on how content engineers and content strategists can, ideally, work together in order to effectively manage complex digital workflows across multiple channels and systems. 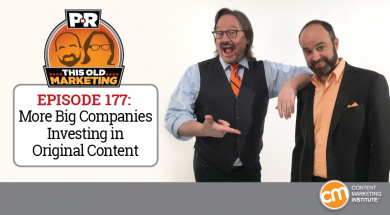 If you are thinking of elevating your game from content marketer to effective strategist, you will need a clear understanding of the six considerations Buddy and Matt discussed. This week’s example has true international flair, coming to us by way of a fan in Australia and focusing on podcast content created by a U.K.-based restaurant chain that serves up American blues music alongside its Texas-style barbecue food. The Blues Kitchen podcast is a weekly show that features blues music and talks with some of the biggest artists in the genre, including George Clinton, Gabriel Roth, The Black Crows, and many more. The podcast, which has been going strong for several years, has amassed over 400,000 subscribers; it also regularly reaches the top spots on the alternative radio charts in the U.K. – and in the U.S. Incidentally, it also holds the current record for the world’s longest musical jam – a 50-hour session that took place in 2014 to celebrate its fifth anniversary. It’s simply an amazing example of a restaurant brand, a music brand, and a content brand, all rolled into one.